They're designed to do that. Yeap no hot air comes through that vent, it would be nice if you could control it. 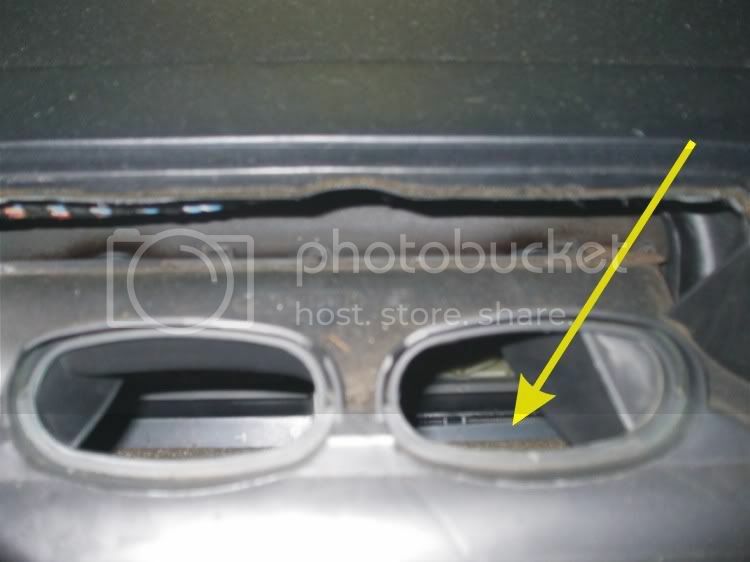 do you mean vents in center console rear end? If that is the same like on the E32, that is only ambient air, hot air comes from under the seat. Finally it is warm enough to work on the 5. Pulled the center console and inspected the stepper motor on the right side of the heater/air box, it works fine so I don't know what is causing only cold air to come out of the vent marked with the yellow arrow. Should I get warm air from any of the other vents on the passenger side? Passenger floor? Right side of console? Knee area on passenger side? It seems to me if it where a broken flap then I should get warm air from all the the other passenger vents except the one marked with the yellow arrow? Is this how it works? There are also a lot of drawings and data to check, for example each temperature sensor in the system, how to check and which data it should show at which degree Celsius. the control of each stepper motor is done by the IHKA control unit and it even compares the speed and things like that. Have you checked the flap you can see from the outside when you remove in engine room the black cover at the firewall to access the blower motor? As I mentioned some month back, the motor for the 2 outer flaps is on the driver side, and the passenger side flap is regulated from this motor too, bith with a bpowden cable. Maybe that is broken? Or just slipped out of the place where it should be? Edit: you mentioned the stepper motor works, but did you remove the stepper motor and check if the flap is broken? Found the problem. I pulled the vent cover in the center of the dash and looked down inside. 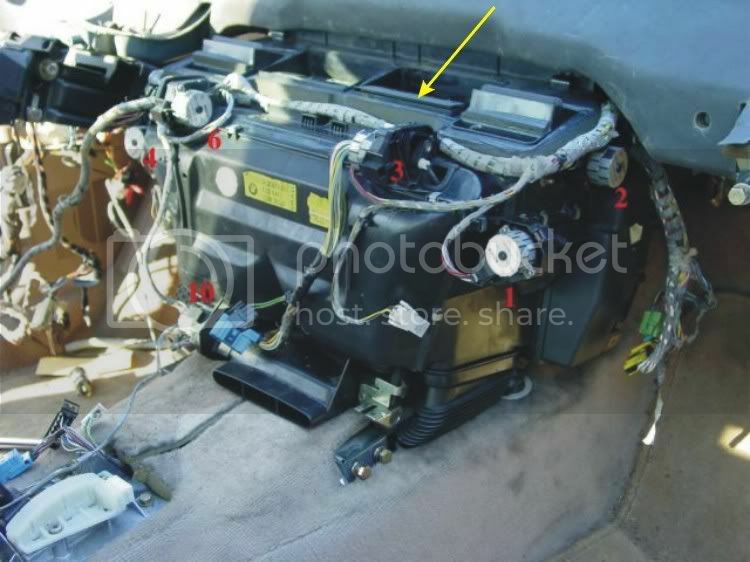 Turning the ignition on and off the vent on the left moved with the step motor the vent marked with the yellow arrow did not. When I turned on the blower the vent on the right popped open, when I held it closed with a screwdriver heat began to blow out of the right vent. So it looks like this vent has no control. Now the question is do I have to pull the IHKA or can I fix it in place? I downloaded the manual and am trying to figure out which stepper motor controls the center vent. Looks like I am in for a evening of Google translation. Man I pray I don't have to pull the IHKA it looks like a real pain. 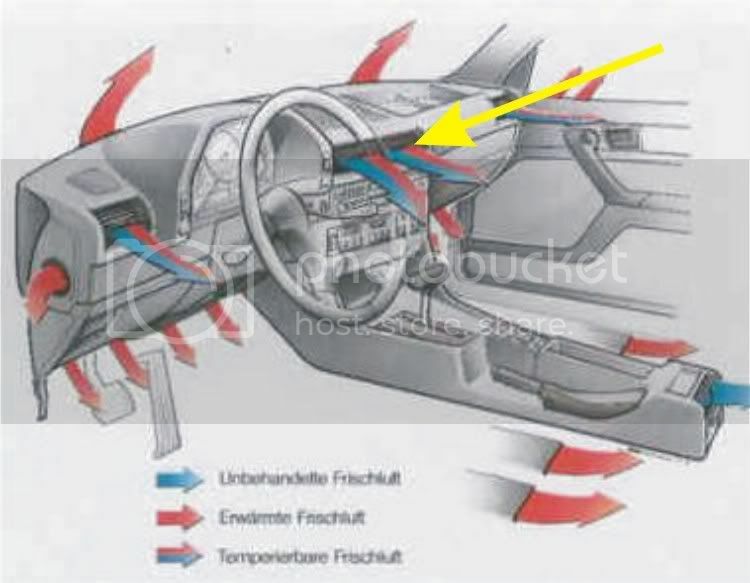 Which motor 2 or 3 controls the left center vent marked with the yellow arrow?